In a globalised society, where objects multiply, specialise and connect (Linked and Open Data), Terminology plays a key role in accessing and managing information: we cannot communicate and share that information unless we agree on the terms being used. The changes regarding information and language processing demanded by this evolution of society have consequences for Terminology itself and for the standards that govern it. The current revisions of the ISO standards on Terminology, its vocabulary (ISO 1087-1) and its principles and methods (ISO 704) also reflect this. 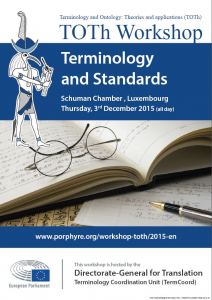 ■ The role of Terminology in the drafting of standards.